Every place holds charm and if you appreciate American architecture, you must visit upstate New York to spend a few nights in Buffalo. Yes, put Buffalo on your travel list. A shipping hub created by canals and rails, Buffalo was once one of America’s wealthiest cities. 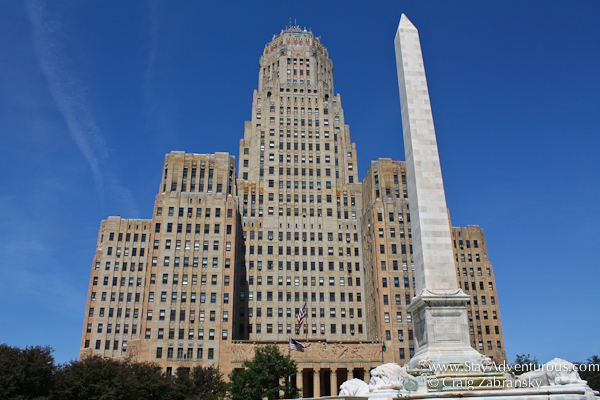 At the turn of the 20th century Buffalo had a higher millionaire per capita rate than New York City. Engraving the history of Buffalo. Afterwards, the city hit hard times. But my recent story about Buffalo through photos (the 5) highlights the architectural gems that remain and also the city’s current resurgence and new construction. 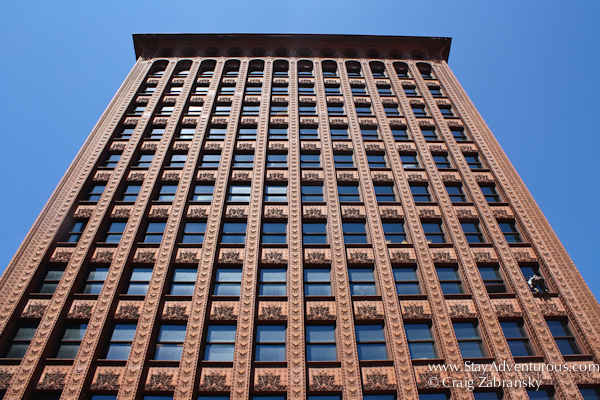 Although I am sure the new edifices will impress, it is not the new buildings that make Buffalo “architecturally worthy,” its the historical ones. 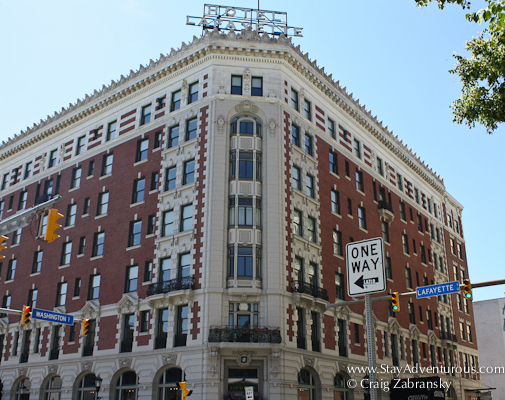 One of the best ways to explore any city is on foot, and after walking Buffalo my perspective of the city (and it’s architecture) completely changed. 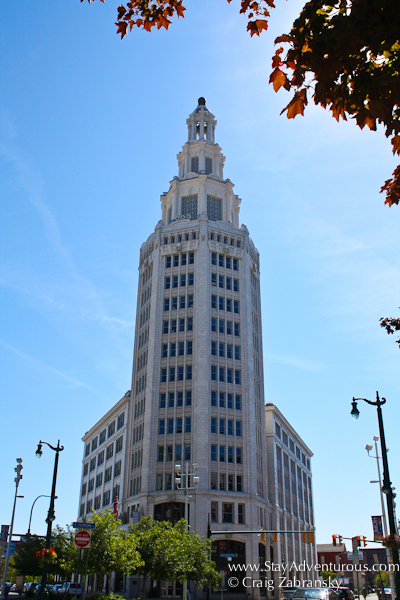 The Queens City Tour offered by Buffalo Tours is a two-hour (estimated 1.5 mile walk) tour through numerous architectural must-sees. 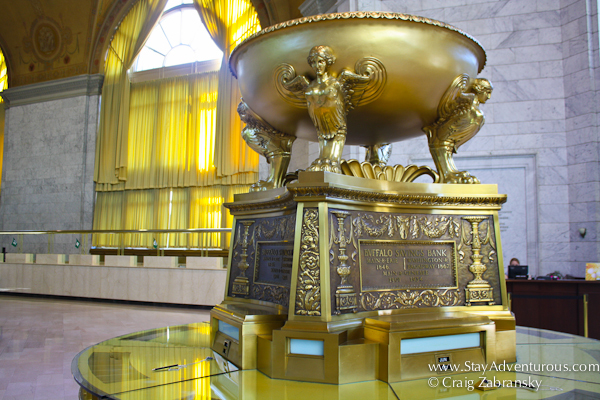 Inside the original Buffalo Savings Bank, the building has a gold dome too. A few of the treasures include the Electric Tower (1912 August Esenwein and John Johnson), the Buffalo Savings Bank (1901 Edward Green), the Ellicott Square Building (1895-96 D.H. Burnham), St Paul’s Episcopal Church (1849-51 Richard UpJohn), the Tiffany Stained Glass Window inside Trinity Episcopal Church, and the French Renaissance Lafayette Hotel (1904 Louise Blanchard Bethune) — one of the finest hotels in the US at the time of its construction. And there’s more. Designed by the first women member of the AIA. 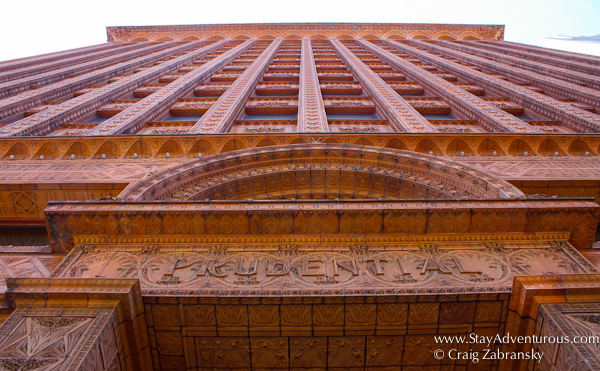 My favorite was certainly the Guaranty Building (1895-96 Louis Sullivan). The soft salmon-color and the tall design were eye-catching for sure and so was the evident attention to architectural detail. A MUST visit for everyone who comes to Buffalo - Impressive. I always considered Frank Lloyd Wright representative of mid-western architectural style, and it seems Buffalo may be considered more mid-west than east coast. Some people even call Buffalo the gateway to the west (sorry St. Louis) and perhaps it is (or really was) for commerce and trade. 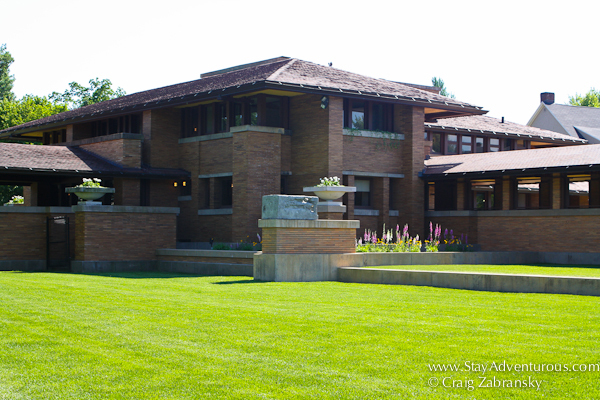 Frank Lloyd Wright’s Darwin D Martin House is a worthwhile visit on the edge of Buffalo. Not located in the city on Millionaire Row- Delaware Avenue – one of the most prestigious addresses in America during the 1880 and 1890s, the house is a journey onto itself. Only outside photos were allowed on the tour. A lot of talk about this huge Pergola. 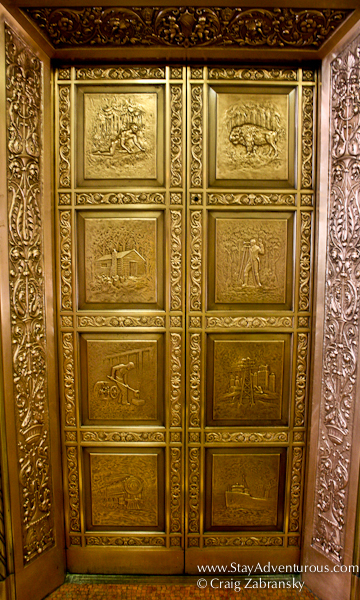 It is also a National Historic landmark offering tours of the five building complex. 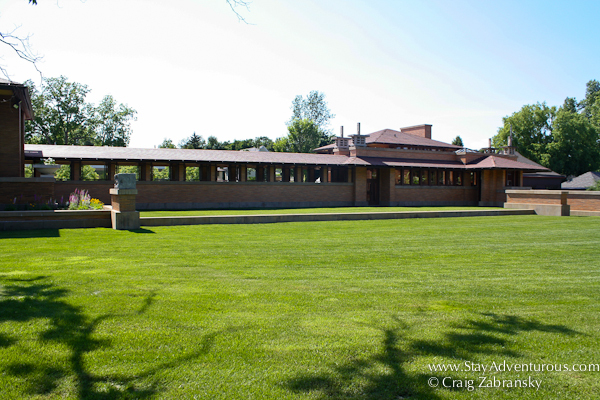 Many scholars consider it one of Frank Lloyd Wright’s greatest achievements during his Prairie period and perhaps his entire career. Besides the extremely knowledgeable guide on the tour, I also met a few Frank Lloyd Wright fan(atics). They had visited most of his works and were greatly impressed by this site. Besides commercial buildings and private homes, public buildings and spaces are essential to making a city special. Places designed for public use are where Buffalo delivers too. 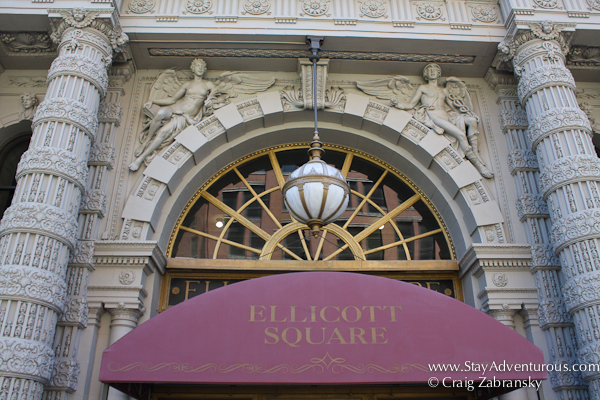 From its Main Street Shea’s Theater to its grandiose art deco City Hall (close to a monument to fallen president McKinley) the city is also a showcase. City Hall and monument to President McKinley. Additionally, the famed Architect of New York City’s Central Park, Olmsted, designed the parks in Buffalo making them America’s oldest coordinated system of parks and parkways. 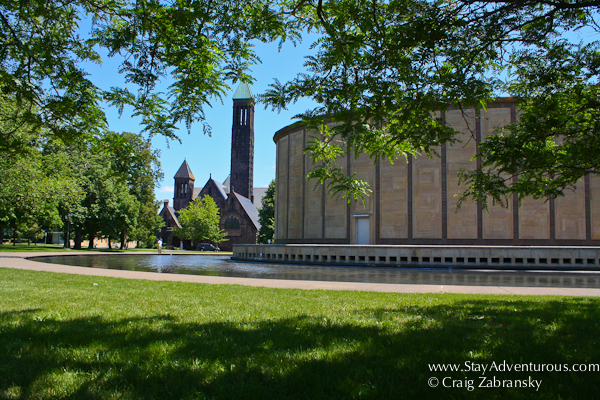 Another must visit is Buffalo’s symphony hall–Kleinhans Music Hall, designed in the shape of a violin, offering award-winning acoustics. Viewing the Bottom of the Violin and a distant church. Really everywhere you turn in Buffalo, a story exists in the architecture. Who knew? I certainly didn’t. And this is just an introduction. There is plenty more to discover about Buffalo’s architecture including new, impressive designs in the works. 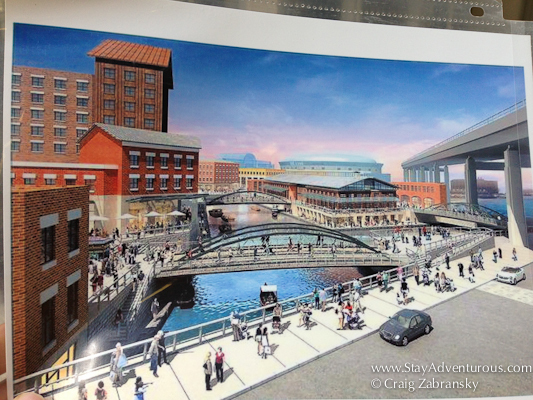 The design for the new waterfront. 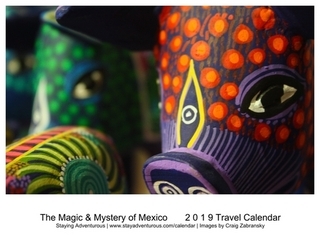 I was a guest of the Visit Buffalo-Niagara during my time in Buffalo; Trivago also sponsors this post. However please know the words and opinions on Buffalo are my own. I thought I would get to visit Buffalo a few years ago when we were in the Cleveland area but ultimately didn’t make the drive up. I know Buffalo is one of those Great Lakes region cities that has fallen on hard economic times, but I have been reading of a great rebound the city is making, particularly in drawing young professionals. We really enjoy architecture; my wife is an interior design writer and loves to drag me around to check it out. She also loves Frank Lloyd Wright. Will have to make it up there one of these days.